This cake is a sponge cake, that’s way easier to make then you may think. No folding in egg whites!! I guess I’ve never mentioned how much I hate folding egg whites…trying to get a cohesive mixture without beating out the air is not always easy. So this recipe doesn’t need it. Simply beat the egg whites to a stiff peak, then add in the egg yolks! Yes, you don’t need to discard the yolks! Then slowly mix in the dry ingredients. In a separate bowl, mix together the milk and use extract. Add this to the batter and mix to combine. Using a skewer or chopstick, poke holes into the baked sponge. Pour the milk mixture all over the cake and allow it to soak in. It may look like it’s too much, but keep pouring, it will all soak in, and you’ll be glad you did! Cover and let this sit for 4 hours or overnight. We can stop here and top this baby with whipped cream and enjoy… or we can add a toasted coconut meringue… uh yes, meringue it is! Whip egg whites, cream of tartar and sugar till it reaches stiff peaks. Add in the shredded coconut and fold till combined. Dollop the whipped meringue over the soaked cake and place in a 350F oven for 10 minutes or until golden brown. I like to place the cake back in the fridge till chilled before serving. Cut into slices and enjoy! Creamy, dreamy and utterly delicious! Preheat your oven to 350F. Grease a 8X8 glass baking dish and set aside. In a separate bowl whisk together the flour and baking powder. Set aside. In the bowl of a stand mixer whip the egg whites and cream of tartar until soft peaks form. Slowly add in the sugar and whip until firm. Turn the mixer onto low speed and mix in the flour a little at a time until combined. In a measuring glass mix together the milk and ube extract. Pour this mixture into the cake batter and beat until smooth. 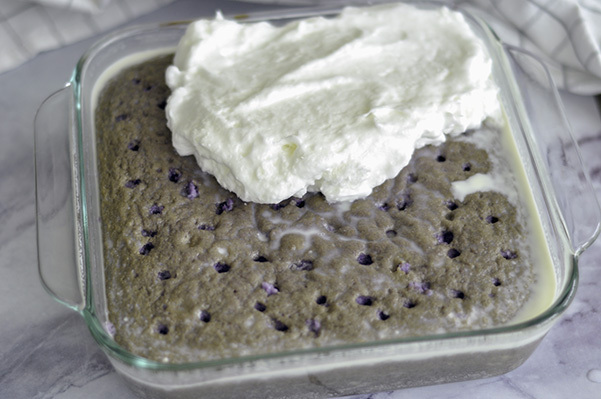 Pour this purple batter into your greased baking pan and bake for 25-30 minutes. The cake will bounce back when you touch it. Cool for 10 minutes while you make the soaking liquid. Whisk together the cream, coconut milk and condensed milk until well combined. Using a chopstick or skewers poke holes in the cake about 1/2”-1” apart. Pour all the soaking liquid all over the cake. It will look like its too much, but wait a few seconds and it will all soak into the sponge. Refrigerate for at least an hour or overnight. Make the Meringue. Whip the egg whites, cream of tartar and sugar until stiff peaks. Spread of the top of the cake and bake in a 350F oven for 10 minutes or until golden brown.